I first came across samples of Yoga Nidra in 2015, during my 200 hour teacher training and I suddenly fell in love with it. Be it because I trained to be a yoga teacher at week ends while working full time during the week, be it because my yoga practice up until then had always been very dynamic and didn’t plan much time to rest, discovering this type of yoga where I had to do nothing but laying down was magical and left me deeply restored each and every time. Now as a Yoga Teacher, I developed a desire to deepen my knowledge of it to be able to share it with my students and allow them to experience the great power of this practice. But let’s take a step back… What is Yoga Nidra? Yoga Nidra is an effortless state of being. A type of yoga that involves laying down or sitting comfortably and listening to instructions. It is essentially a form of meditation, approached in a different way, where the purpose is to do nothing. The first part of the practice involves settling in a way that is completely comfortable. This can be done laying down on a yoga mat or some blankets, propped with cushions, bolsters and blankets to make sure the body stays warm enough or even sitting down. This has the aim to allow the practitioner to relax. Once comfortable, there is no desire to move, but if this arises, moving consciously is allowed, to then return to a state of stillness. Once settled, the practitioner simply listens to the teacher’s instructions and is guided by their voice on a journey that starts and ends in the physical body. This usually includes rotation of consciousness, a technique to relax the body and the mind. It puts the practitioner in a state of trance and honours the physicality, offering the opportunity to check in with the physical self. There is often reference to the breath and use of visualisations. This practice can vary greatly in length (from few minutes to over the hour) and style. There are several schools and lineages and they offer different structures and ways to achieve the same outcome. Yoga Nidra brings the practitioner on the edge between asleep and awake; he or she enters an altered state of consciousness. It is a journey through different frequencies of brainwave activity and thus different states of consciousness. In early stages of the practice, Alpha waves dominate; these aid mental calmness, alertness and learning. In deeper stages, Theta are dominant. This time enhances creativity and memory. Particularly interesting is that Delta brain waves can be measured during the practice of Nidra. These are waves usually generated during dreamless sleep and have a powerful healing and regenerative effect on mind and body. Traditionally Yoga Nidra was practiced for the purpose of spiritual enlightenment, more recently people approach it for physical and psychological wellbeing. It is a very healing practice, especially when done consistently. Yoga Nidra is adaptogenic, meaning that it adapts to the needs of the practitioner who is consuming it. If they need sleep, they will sleep. And that is OK. Sometimes practitioners can not tell if they were awake or asleep as they were in the space in between. They may not remember what they heard, but easily come back when they hear the teacher closing the practice. Whatever happens during the practice is perfect. There is no right or wrong. It’s ultimately about coming home to yourself. Not only it gives permission to do nothing, it asks that you do nothing. Even listening to the words of the teacher is optional and not needed to reap the benefits. Most people nowadays connect with Nidra because they are stressed or can’t sleep. But it can also be a great tool for problem solving and to move forward in life. 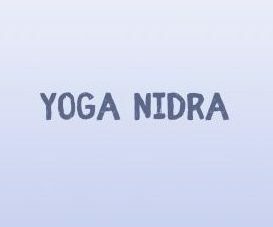 Nidra teachers have developed sessions to aid with sleep issues, to boost creativity, problem solving and much more. There is a Nidra for everything and everyone. It’s a practice that is accessible to all people, from children to elderlies. A qualified teacher will be able to tailor 1:1 sessions to individual needs to make it even more powerful and specific to the desired outcome. Here are some free recordings you can use if you are curious to try this form of yoga. The Total Yoga Nidra Immersion with Uma Dinsmore Tuli inspired this blog.